Storage: Refrigerate 3 weeks, otherwise freeze. 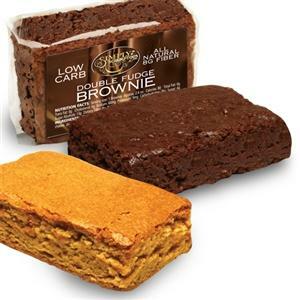 Ingredients: WATER, WHOLE WHEAT FLOUR, VITAL WHEAT GLUTEN, OAT FIBER, ENRICHED WHEAT FLOUR (WHEAT FLOUR, NIACIN, REDUCED IRON, THIAMINE MONONITRATE, RIBOFLAVIN, FOLIC ACID), Contains 2% or less of SOYBEAN OIL, MALTITOL, YEAST, WHEAT PROTEIN ISOLATE, SODIUM ACID PYROPHOSPHATE, BAKING SODA, FUMARIC ACID, POTASSIUM SORBATE AND SODIUM PROPIONATE (PRESERVATIVES), CELLULOSE GUM, GUAR GUM, XANTHAN GUM, MALTODEXTRIN, SALT, ANNATTO EXTRACT (COLOR), CALCIUM SULFATE, CALCIUM PEROXIDE, ENZYMES. CONTAINS: WHEAT AND SOYBEANS. 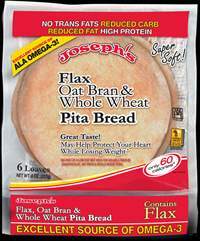 Contains: wheat and soybeans. 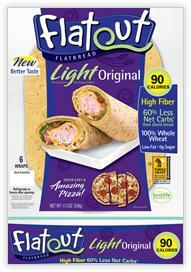 FlatOut FlatBread Light Wraps are half the calories and carbs of traditional whole wheat bread. Use for wraps, pizza, and more.